No doubt, Warner and Smith are the golden-boys of Australian cricket. 2018 was an eventful year for cricket. We saw a new-look Indian pace contingent and a totally different Australian team that we have been exposed to, over the years. In fact, 2018 was a year to remember for Afghanistan but it was a forgettable year for the once mighty Aussies. All this while we’ve known Australia as a group of competitive players who would do whatever it takes to win the game for their country while staying within the boundaries. However, on March 28, 2018, everything changed. The whole complexion of the Australian team balance changed and since then we’ve seen them hit the rock-bottom. Following the infamous ball-tampering saga, stalwarts David Warner and Steve Smith were banned for a year and Australia never seemed to recover from the blow of losing two of their best players. 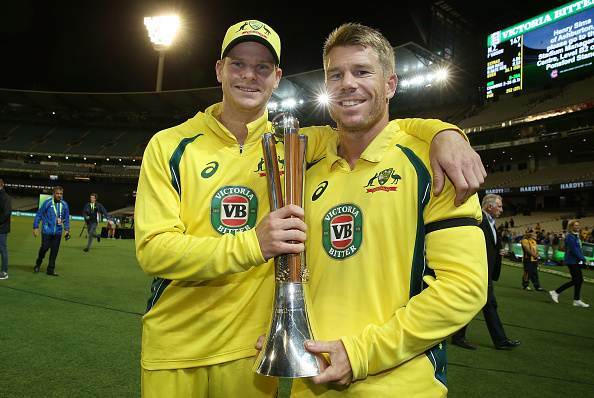 No doubt, Warner and Smith are the golden-boys of Australian cricket and what they did is a punishable offense and in many ways, the current Australian team needs their stalwarts back. Luckily/unluckily (we shall discuss the reasons why) their bans end on April 2019 and it means that they would be available for the World Cup. In many ways Warner and Smith’s inclusion to the Australian ODI squad could impact their WC chances both, positively and negatively. While the positive reasons are pretty obvious, let’s have a look at the 3 reasons why their inclusion to the squad might do no good to the current Australian set-up and its ICC WC 2019 chances. Warner is an opener and Smith is a number three batsman. Now imagine that both of these players get out in the opening over of the game. The rest of the team would still be the same and as we established earlier, Australian cricket team is in shambles at the moment and the rest of the team will crumble under tense situations like they have, in the recent past. The bowling attack is being carried by Pat Cummins at the moment and Starc looks woefully out of form at the moment. Their trusted all-rounder in Stoinis isn’t providing those solid finishes towards the back-end of the innings and his death-bowling isn’t as consistent as it used to be. Basically, the day Warner and Smith fire will be the day we’ll see the Australian team walk-out with confidence. The limited-squad isn’t exactly on a winning spree at the moment and any further damage to their confidence and morale will put Aussies’ WC chances in a precarious position. In my opinion, stick with the current team and have Warner and Smith (depending on his availability) as the reserves as the team morale and confidence always trumps an individual player.